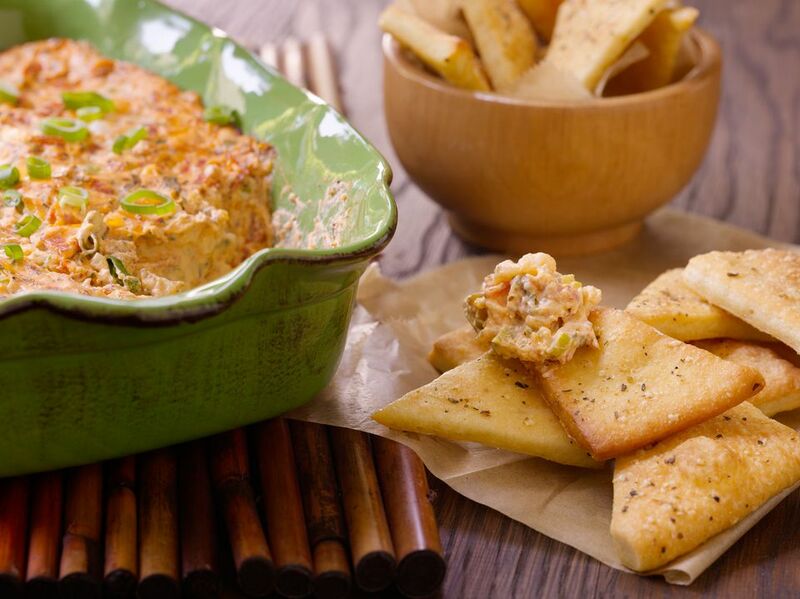 Pizza fans will want to do a touchdown dance every time they eat this cheesy pepperoni dip. All of the traditional pizza flavors find their way into my football-ready appetizer, plus a few more just to make it interesting! The delicious dippers are simple to prepare and can be popped right in the oven, so you don't have much fuss before the game is on. While this dip is big on flavor, it's not quite as big as the world's largest pizza. There are several cheeses used, too, and they bring something different to the table—literally! The history of pizza may be captivating, but the yummy dip in front of you will grab your attention. Load up on some dip (and dippers!) and take a seat in front on the big screen for all the gridiron action. To prepare the dippers, combine the Parmesan, Italian seasoning, and garlic powder in a bowl. Set aside. Roll out one pizza dough on a lightly floured work surface and cut into 18 squares. Then cut each square in half diagonally to form two triangles. Arrange the triangles on a baking sheet and brush each one with olive oil. Sprinkle the Parmesan mixture over the triangles. Repeat with the remaining pizza dough. There will be a total of 72 triangles. Bake for 10–12 minutes, until golden brown. Remove to a wire rack to cool. To prepare the dip, whisk together the cream cheese, sour cream, oregano, basil, red pepper flakes, garlic, pizza sauce, pepperoni, bell pepper, scallions, cheddar, and 3/4 cup mozzarella in a bowl. Evenly spread out the mixture in a shallow 2-quart ovenproof dish. Remove from the oven and sprinkle with the remaining 1/4 cup mozzarella. Serve hot with the dippers. Cook's Note: Be sure to soften the cream cheese to make it easier to mix with the rest of the ingredients. Love pizza and want more ways to serve it? You can find plenty of unique and tasty recipes to make on game day or any day.